How fitting that, in the wake of the cataclysmic outcome of the 2016 election, I am reviewing a book whose plot is driven by one character's impending deportation. Like, this book was so real when I read my ARC in July, and it was even more real last week when I skimmed through it again because I was supposed to post this review a week ago but of course that did not happen, and now it's even more more real post-election. Before I start actually ~reviewing~, a brief preface/disclaimer. If you don't know, this book is about two teens -- Natasha and Daniel -- and takes place over the course of one day, a day that begins with them meeting and ends with Natasha (and her family)'s deportation to Jamaica. Some of the reviews I've read have chided it for instalove, but I think in a book marketed as a love story, with the time restrictions of the plot very clear in the description, it's inevitable that two characters will develop a relationship more quickly/intensely than would work in another, slower paced book. This doesn't mean it's something bad and I think it's something that works within the vacuum of books like this. Anyway, I have so much to say about this beautiful, beautiful book and I have no idea where to start. We have Natasha: a fan of physics and math and the nontemporary and measurable (read: does not believe in love) and Daniel: supposed to go to Yale and be the Perfect Korean Doctor Son but really wants to write sad poems and look into people's eyes and talk about love all the time. Their paths cross and the story alternates point of view between them. Even though it mostly focuses on the day at hand, sometimes there are some introspective chapters about their lives and one of my favorite parts of the book is that there are a lot of cool vignettes. I said it alternated between their POV and while that's mostly true, there are short, one or two page scenes from the view of the USCIS officer, or Natasha's dad, or the train conductor, or explaining multiverses. I loved the vignettes so much, I thought they added such a nice touch to the story. Daniel and Natasha themselves were such well developed characters, along with their families and even the one-off characters. I could feel Natasha trying to quash her own hopes when going to the USCIS building because, in her words "The trouble with getting your hopes too far up is: it's a long way down." I felt the seed in Daniel growing that wanted to throw caution to the wind. I felt the tiredness in Mrs. Kingsley's body after years of living her life with no reprieve. In a book with everything happening so quickly, it would have been so easy for character development to have been hasty and forced, but it felt so easy and natural, like they had known each other their whole lives, like they just fit together. Of course, a lot of parts of the book might not have worked if the writing wasn't as eloquent as it was. Like, I went back to some of the pages I marked for quotes and just ended up reading half the book over again because it was so captivating. There is something elegant written on every page. Some books are all elegance and no substance but The Sun Is Also a Star packed so much into so few pages. Natasha and Daniel tackled their different experiences as first-generation immigrant children of different social classes, with different expectations of them and different expectations of their parents. They talked about uncertainty in life and love and there was just so much to take away from this book, whether from Natasha and Daniel and their 36 questions, or their respective families, or the short glimpses into other characters' lives. 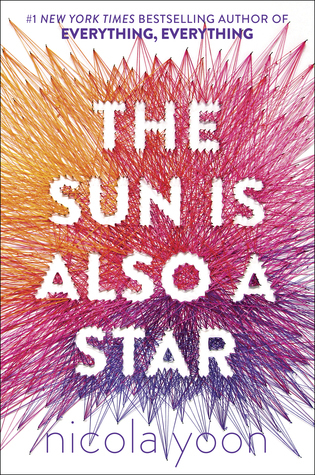 I could honestly gush about this book for hours so I will stop here while I've kept some coherency, but on an end note: when Nicola Yoon's first book, Everything, Everything came out last year, I absolutely loved it and was both excited for her next book but afraid it would not live up to her debut. The Sun Is Also a Star has destroyed those fears and shown that Yoon is a phenomenal author with a beautiful gift for spinning words and I cannot wait to read all the books she writes in the future. Do you believe there is a science to falling in love?